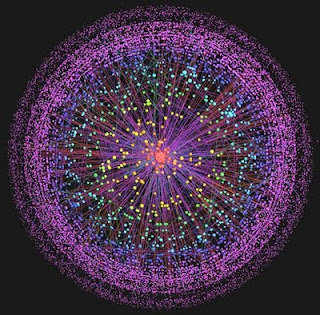 In 21st century Intertubelandia, everything's connected to everything else. From the perspective of a web-oriented or mobile-oriented software developer, that often means that some part of what gives value to the software one builds is the available and accessible software that someone else is running elsewhere in Intertubelandia. Examples on the web: If you've ever visited a web site that offers the option to click a button that translates the page into another language -- perhaps one you can understand more easily -- you're likely seeing a link to the Google Translate web element. If you've set up a iGoogle or a My Yahoo! page, and populated it with widgets that show you the weather in your city, or a scrolling feed of what your Facebook pals are up to, or the latest news from the New York Times or CNN, you're taking advantage of services being run someplace other than the company or organization whose URL you're visiting. Examples on mobile devices: If you own or have test-driven an Android-platform mobile phone, or an iPhone, or an iPad, and have fiddled with apps that allow you to discover what movies are playing nearby, or to check in on foursquare, or to tweet, or to update your Facebook status, or to check stock market prices -- you've taken advantage of somebody's server running someplace, somewhere, that's communicating with an app on your device. How does all this technomagic work? The devil's in the details, but the short answer is via exchange of data through a set of consistent patterns of request and response that programmers call an API -- an application programming interface. When a programmer creates software that relies on somebody else's service being available and accessible, she strongly prefers that the relied-upon service be stable. Stable means that the API -- the patterns by which data is exchanged -- won't change radically or frequently, so she won't have to rewrite her software over and over again. Stable also means that the service will continue to be available, so that her software continues to work. There are a lot of programmers out there in Intertubelandia who count on Google services to remain stable. On its face this seems like a reasonable expectation. Google is a very large company. They employ a lot of talented engineers, and their server farms are ginormous. They are as popular, powerful, and highly-valued as they are in large part because their stuff works consistently and is pretty much always there (except when it breaks, as things do). Caught up in its ubiquity, it's easy to forget that Google has its own agenda. And that having an agenda means that the company might shift directions for reasons that aren't obvious, or at times that aren't predictable. [...] some of our older APIs have been superseded by bigger and better things and others may not be receiving the necessary love. As the web evolves and priorities change, we sometimes deprecate APIs – that is, remove them from active development – to free up resources and concentrate on moving forward. Today we're announcing a spring cleaning for some of our APIs. The blog post's author was Adam Feldman, Google's product manager for the company's APIs. He went on to list twenty APIs that Google would deprecate, including a number that will be shut down later this year -- not just "remove[d ...] from active development," but killed outright. Some of the APIs that are being shut down are pretty popular. That is, a lot of developers have relied on those APIs to make their own software interesting or valuable. These software developers are confronted with two choices. They can find another way to obtain the functionality offered by the marked-for-death Google APIs, or they can give up on their obsolete software. idndomains: "I guess A LOT of webservices will be hurt. Your new APIs are either pure bullsh[*]t or specially aimed to promote your own affiliates." Franz Enzenhofer: "i have a question: why should any developer, any company which wants to build a valuable product for the long term use any of your APIs ever again?" elmar: "I'd also like to voice my disappointment with the shutdown of the Translate API. It was a really cool tool for experiments in the language learning space." Paul Dixon: "This news makes me sick." Shortseller: "This is a pity. Is there any option to let the translate api live on a paid basis?" Alexu: "Charge for Translate API, don't shut it down!" In a very odd coincidence, on the very day it was announced, I discovered the Translate API was going bye-by as I wrote a blog post for Project Bamboo, in which I am involved through my job at UC Berkeley. My post announced a service that a colleague has just made available. That service relies on the very same Google Translate API that is now deprecated and set to shut down in December. Though we announced our service to project colleagues on the day Google Translate was slated for the dust-bin of intertube history, we're fortunate that our service is meant only as an example and an experiment -- a pattern for other services our project is slated to produce. We only needed Google Translate as an example of a remote service that our services can call. There's not a lot we invested in hooking up to Google, and by the time the Translate API goes away we won't need it anymore. The larger lesson is clear: you can't count on 'free' or 'experimental' services. If you do, you're going to be disappointed or worse. Is it really Google's fault? Did Google do wrong in deciding to shut down some of its APIs? I don't think so. Harm, perhaps, but not wrong. The thing is, there's nothing surprising about Google deciding to shuffle its portfolio of service offerings. They never promised otherwise. They're a for-profit company -- with shareholders, even. What else could anyone reasonably expect? The company exists to make money. One commenter on the 'spring cleaning' blog post noted, "It doesn't seem like Google is being honest regarding the reason for shutting down these APIs" (Amos Benninga). I'd have to agree. 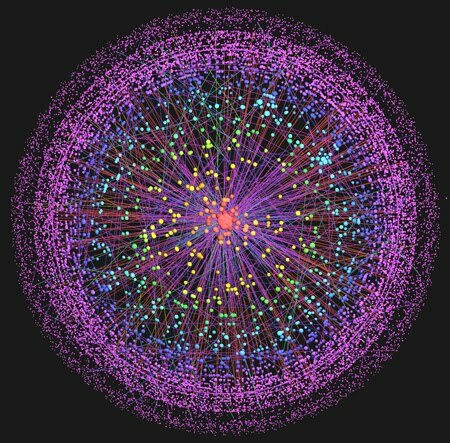 "As the web evolves and priorities change..." ... I mean, puh-leeze. On the other hand, that's not surprising either. "Don't be evil"? Remember those three famous words? Wikipedia calls them "the informal corporate motto (or slogan) of Google, originally suggested by Google employees Paul Buchheit and Amit Patel at a meeting." The key word there is "informal." Google's "philosophy" states something a little bit different: "You can make money without doing evil." The key word there is "can." It's silly to expect a for-profit company to continue to offer a service just because you like it or want it or even need it. You've heard of slow food, right? I mentioned in a January post that I'd just begun to read Leo Tolstoy's War and Peace, in the translation by Richard Pevear and Larissa Volokhonsky. I mentioned that the novel is 1,213 pages long. I referred to "the hours it will take to read" this classic work of fiction. That was four months ago. Almost five. See where I'm going here? I've just finished Volume Two, Part II, which puts me about a third of the way through Tolstoy's masterwork. At this rate, I'm not even going to make it to the finish within a year, which is what I kind of sort of promised myself at the outset. 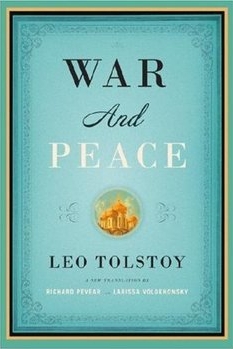 It's not that I'm not enjoying War and Peace. It keeps getting better. And I even like the pace of it, the discursive byways, the sharp portraits of characters that I suspect I'm never going to meet again. Meandering through Tolstoy, you can't miss the fact that 19th century Russians really loved to read. I made myself a couple of promises when I started out, puzzling through the French opening in which Anna Pavlovna Scherer speaks her mind on the subject of the Antichrist, a.k.a. Napoleon. A couple of promises in addition, I mean, to the kind of sort of promise to get through the volume in a year. First, I promised myself I would continue to read other fiction in parallel, because I knew there was no way I'd be able to put this ultra-long novel ahead of everything else on my list until I crossed the finish line. I've kept that promise. 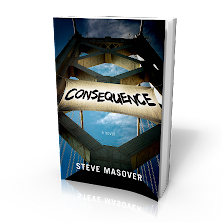 Second, I promised myself I would keep making regular progress, however slowly, until I do finish the novel. I was determined not to set myself up as I had vis-à-vis the books I wrote about in September, in Unhappy reading experiences: Roberto Bolano's The Savage Detectives (still unfinished on my bedside shelf, bookmarked at page 309); or Thucydides' The Peloponnesian War (which I might or might not return to before I shuffle off this mortal coil). So far so good on that front too. A novel over the course of a year (or fifteen months at my current pace)? That's slow reading if ever there were such a thing. One thing I wonder is whether I'd make better progress if I read on an iPad or a Kindle or a Nook. I may never know, I'm still pretty resistant to reading fiction on a screen. I have too many screens in my life. On the other hand, Tolstoy's 1,213 pages -- nearly 1,300 if you count the front and back matter -- are a compelling argument for as many books as you like in a 10 or 12 or 18 oz. device. I can assure you that it's a rare weekend morning when I throw Tolstoy into my bag and hike off to a café. I don't pack it into my carry-on when I travel. It's too darn big. Still. I'm committed, at least for now, to "tree flakes encased in dead cow" (as William J. Mitchell described books as we've known them for the last several hundred years, in City of Bits). Are there books you've stuck with over the long haul because you really wanted to read them but couldn't manage to plow straight through? Which books? Was it worth the time and effort in the end? I figured the last evening before Rapture would be a great time to see Werner Herzog's 3D documentary, Cave of Forgotten Dreams. 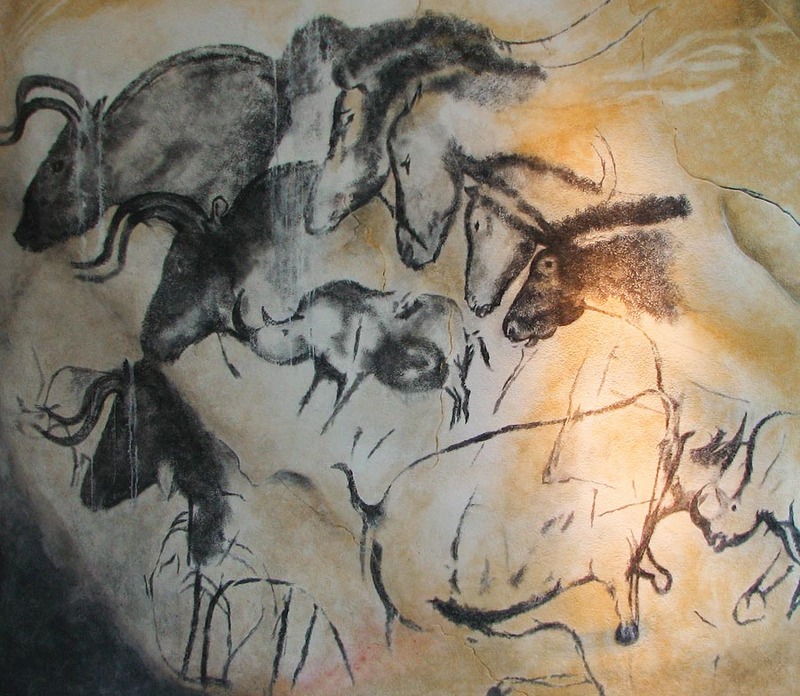 The film is a lingering look at the cave of Chauvet-Pont-d'Arc, where, in 1994, a trio of explorers including the eponymous Jean-Marie Chauvet discovered a trove of paintings dating back as far as 32,000 years. As many reviewers, including Manohla Dargis of the NY Times, have said already, "it's a blast to be inside the cave, to see these images, within 3-D grabbing reach" even if, as Dargis continues, "[t]he 3-D is sometimes less than transporting" as cinematography. Herzog was given a few hours each day for a week, a small crew, not much equipment, and strict constraints about staying on a narrow runway laid through the cave to preserve its stone and bone from the degrading effects of human presence. Herzog worked with what he had. Bottom line, what emerged is 3D that grants anyone willing to pop for a movie ticket a chance to see these ancient, magnificent, and otherwise inaccessible relics of human culture. One can think of it this way: Herzog made far better use of now-ubiquitous 3D film technology than filming opera singers' tonsils (as Matthew Felix Sun archly observed last month); or making patronizing propaganda about noble savages, as Maureen Jameson incisively described in her Jan 2010 smackdown of the 3D film Avatar. That the paintings are so fully rendered is breathtaking, and being able to see in 3D how they blend with and are enhanced by the curves and bulges of the walls at Chauvet is a ninety minute inducement to reassess the meaning of "primitive." The best of the paintings are as far removed from awkward, experimental sketches as Albrecht Dürer's prints are from my own pathetic attempts to draw in charcoal (don't ask). These works of art were created by people with sharp eyes and skilled hands and a goodly amount of practice. At the time, so far as we can tell about Europeans in the era when the Chauvet cave paintings were produced, these folks were big-game hunters, wore crudly-woven clothing, and lived in patchwork shelters made of branches, clay, and animal skins. By many of today's measures they were savages. And yet. Discoveries at Chauvet mark them as humans as noble as any, at least as one attempts to measure by the cultural relics they left behind. But here's what made the hair on the back of my neck stand on end: at least one of the sets of animal paintings, Herzog narrates, is formed of an image applied to a blank wall of the cave, and another superimposed on it five thousand years later. That number rocked my world on Friday night at the Landmark Theatres. Yeah, I can blithely talk about "32,000 years ago" or "billions and billions of stars" or a "national debt of $14,000,000,000,000." But as I say them, those numbers feel empty of meaning. One loses hold of scale. But five thousand years? That's a concrete number I can get my head around. Why is that? Maybe because five thousand years is the entire span of recorded human history? That is to say, cuneiform writing appeared in the cradle of civilization, between the Tigris and Euphrates rivers, five thousand years ago. Nothing anybody knows about articulated human history, nothing other than what can be inferred from material evidence, originates further back than about 3,000 B.C.E. The paintings at Chauvet are waaaaaaaaaaaaaaaaay older than that. But the span of time during which they were created, during which the Chauvet artists were drawing over each other's work, was as long as the entire span of recorded human history. As long as from now back to the dawn of human writing. Imagine yourself, today, scribbling over some Sumerian's doodles from the late Uruk period. Consider your intimate acquaintance with the Sumerian doodler's everyday life, knowledge, beliefs, habits, diet, economy, and relationships. Okay? As long ago as that is the distance separating early Chauvet painters from the cave's later artists, who had necessarily to consider their predecessors in relation to their creations on the same stone canvas. And the most recent end of that five thousand year span is five times that temporal distance backward from now. Moreover, for ten or fifteen bucks you yourself can see the work of these artists right there on the 3D screen in Herzog's film. "We're going to listen to the silence in the cave, and perhaps we can even hear our own heart beats." But ... silly narrative bloopers aside, if you can find a theatre showing Cave of Forgotten Dreams in 3D before it becomes even more of an art house rarity than it is on release -- do see it. It's the chance of a thousand lifetimes. In a sickening sort of way, news coverage around the Fukushima Daiichi nuclear plant meltdown in Japan still has me hypnotized. It's news this week, by the way, that "the m-word," as Jonathan Soble of the Financial Times put it yesterday, can be applied to this still-unfolding disaster with what the news media consider some degree of certainty. As hypnotizing as the coverage itself is the way news media are spinning it. "American officials had said early on that reactors in the United States would be safe from such disasters because they were equipped with new, stronger venting systems. 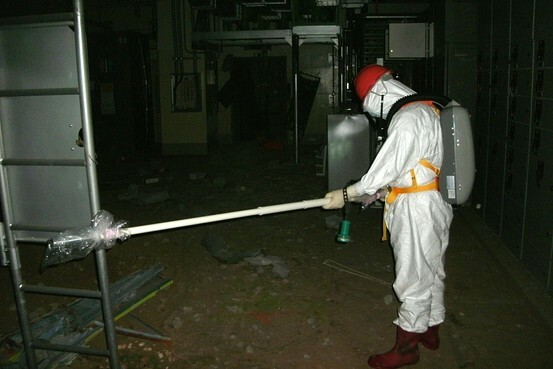 But Tokyo Electric Power Company, which runs the plant, now says that Fukushima Daiichi had installed the same vents years ago." "But the release this week of company documents and interviews with experts provides the most comprehensive evidence yet that mechanical failures and design flaws in the venting system also contributed to delays. The documents paint a picture of increasing desperation at the plant in the early hours of the disaster, as workers who had finally gotten the go-ahead to vent realized that the system would not respond to their commands." Compare that with FoxNews coverage of the same date: Japan To Stand By Nuclear Power At G-8 and Tepco Says It Can Still Bring Japan Nuclear Plant To Safe State In 6-9 Months ... a rather different spin, wouldn't you say? Full disclosure, as if it weren't obvious: I trust the New York Times further than I do FoxNews to deliver fair and balanced reporting. And as I've written in many posts before today, I think it's foolish and hubristic to pretend we (humans) can engineer our way out of catastrophic risks posed by the choices we have made about energy consumption and production. I wonder how long Japan's nuclear reactor disaster will remain an "issue" as opposed to an instructive lesson in human fallibility. What will it take for FoxNews to face the risks nuclear power poses? 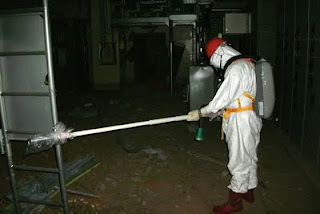 What would it take for the corporations that profit from the nuclear power industry to be accountable for those risks? What scale of disaster might motivate citizens of the United States to insist on straightforward analysis, and policy driven by honesty instead of corporate balance sheets? The NY Times, reporting on the demise of blogs in February, gave unique-visitor stats to Google's Blogger service as 323 million in December 2010, a 9% gain worldwide. It's kind of a funny article, in that all the 'evidence' for the death of blogging is allegorical ... whereas the numbers lead to an opposite conclusion. 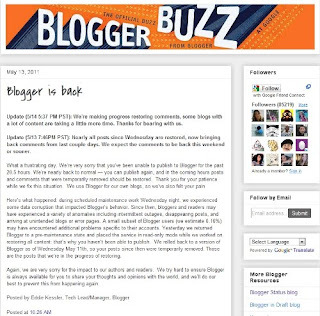 Bloggers at Google-owned blogger.com were locked out of their blogs for a number of hours overnight, apparently after a behind-the-scenes update that went awry. The outage continued for more than twenty hours, during which posting and commenting was blocked. Content posted on Wednesday and Thursday disappeared, among other disconcerting rips in the fabric of the intertubes. Google promised the missing content would be restored, but, well ... you know ... one hoped for the best. As far as I can make out, much of the affected content does appear to be back on-line as of Sunday evening, though Blogger's status updates have not yet declared that data is fully recovered. I am aware of at least one blogger whose posts are back on-line but whose comments are still MIA. We’re nearly back to normal -- you can publish again, and in the coming hours posts and comments that were temporarily removed should be restored. [...] Here’s what happened: during scheduled maintenance work Wednesday night, we experienced some data corruption that impacted Blogger’s behavior. 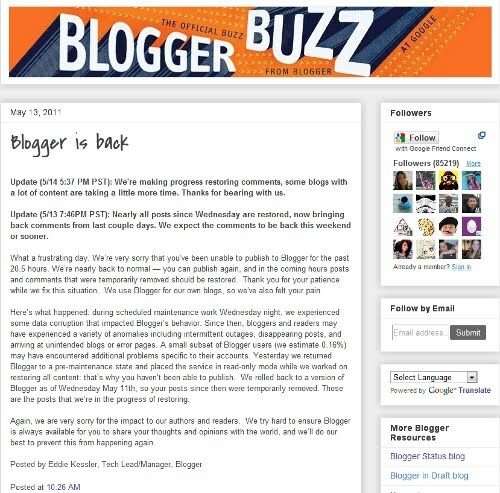 Since then, bloggers and readers may have experienced a variety of anomalies including intermittent outages, disappearing posts, and arriving at unintended blogs or error pages. A couple hours after that announcement this blog was still unrestored, and when it did come back my latest post was incorrectly timestamped and its labels had been concatenated into gibberish. No big deal. I fixed it Friday evening. If your data matters, you need a hybrid strategy, with local storage and local content creation and editing tools. If your local storage fails, you can grab what you need from the cloud. If your cloud service fails, you’ve still got it locally. But if you rely just on the cloud, you’re vulnerable to exactly this sort of failure. Whatever way you save your blog posts, backup matters. For your digital copies -- whether in blog export format, e-mail, word processing formats, etc. -- be sure you take the same kinds of precautions with the data that you would with any other file(s) you hope to keep beyond the life of your current computer's hardware. Back it up. Save it in a safe place, on a device that you will be able to read into the future. When technology changes, it's your responsibility to move data to a format or device that the new technology can read. If you delay this chore, it can become onerous or impossible, as my experience converting a pile of near-obsolete 5.25" floppy diskettes showed me earlier this year. There are no magical solutions to this problem ... letting a "cloud" provider safeguard your data works until it doesn't; and that nifty floppy / CD / DVD / Zip disk / external hard disk / flash drive will become obsolete in two or five or ten or fifteen years. Bank on it. Did I get my knickers in a twist when Blogger went bye-bye last week? Nope. A friend and frequent commenter on this blog e-mailed on Friday, wondering what happened to Thursday morning's post. He wanted to comment on it, he said, but all of a sudden it had gone missing. "I'd say something here about 'I hope you have a copy,'" he wrote, "but I know you well enough to know that there at minimum there's one copy, possibly multiple versions!" He was right. I take my own advice. By the time this post hits the intertubes, most bloggers hosted on Google infrastructure will have been made whole, or whole enough to repair the damage without too much trouble. I hope that doesn't leave too many feeling too complacent. In late January of this year, literary agent Stacy Kendall Glick at Dystel & Goderich wrote a blog post she titled What I'm Looking For. In agentspeak, that means the sort of work and authors from whom she especially welcomes queries. A post like this is fabulously valuable to an author ... especially, of course, if what the agent is looking for matches a project for which the author is seeking representation. Alas, what Ms. Glick wrote about the type of book I write was not the stuff that dreams are made on. "I'm signing up a lot less adult fiction," she wrote, "because it's so hard to sell but also because my time is limited and fiction can take a lot of work to develop." Boy, do I get that. Fiction takes a heck of a lot of work for an author to develop, and (extrapolating here, because in actual fact I am not now nor have I ever been a literary agent) it's easy to imagine that an agent who takes on a fiction project, especially fiction written a debut author, is likely to have a lot of reading and suggesting and cajoling and re-reading and further suggesting to do before the manuscript is ready to see the light of an editor's desk lamp. Interestingly, I wasn't discouraged by this frank acknowledgement by an experienced & reputable agent who works for a top-drawer New York agency. Not even a little. Well, the easy answer would be that there are a lot of agents (and editors) out there. What Ms. Glick is less eager to represent is another agent's bread and butter. But ... glad as I would be to find an agent, to see the agent find an editor interested in pitching my manuscript to a publisher's acquisition board, to be courted by a publisher eager to put my manuscript between covers and into bookstores, and from there to find a vast (or even respectable!) community of readers ... the truer answer would be that I don't write adult fiction because I think it's the most likely path to that sort of success. Nope. I write adult fiction because adult fiction is what I love to read, adult fiction is what kindles my creative passion, writing adult fiction is what I really, really, really want to do. A few weeks ago Nathan Bransford posted a video on his blog without much in the way of explanation. Nathan is a former literary agent whose first novel, Jacob Wonderbar and the Cosmic Space Kapow, is being released today, 12 May 2011 -- congrats Nathan! So ... what's the connection? How does Scott Weaver's elaborate construction have anything to do with adult fiction being hard to sell? Mr. Weaver didn't take 35 years (yes, you read that right) to build his truly, geekily cool toothpick-sculpture-slash-ping-pong-ball-obstacle-course because he thought he could sell it, or because he figured it would bring him fame and immortality. I mean c'mon, does the guy sound crazy to you? Mr. Weaver built his sculpture because it's what he really, really, really wanted to do. When the phone rings and the caller is that agent who does want to represent my finished adult fiction manuscript, Consequence, can you guess what I'll be doing? Yup. That's right. I'll be working on my next adult fiction project. It's what I really, really, really want to do. What do you do just because you really, really, really want to? This may be old hat in libraries across the country (actually, I think it's a several-years-old trend), but when I visited the Berkeley Public Library this past weekend I stumbled upon their "Book Club To Go" shelf for the first time. It's prominently featured in the five-story, Art Moderne library's main lobby. As near as I can tell it's a newish offering: the BPL Facebook page has an announcement about "Book Club To Go" dated from December of last year. The San Francisco Public Library has a similar program. Each of Berkeley's "Book Club To Go" package includes eight copies of a book and a discussion guide, all handily packaged in a plastic bin. Like any other library resource, if someone else has the set o' books your group wants to read it's possible to see that it's checked out and to put a hold on the BCTG package via a quick visit to the library's web site. The packages are loaned for six weeks, and can be renewed for another three weeks if no one else has placed a hold in the meantime (normally the BPL loans books for three weeks, with an option to renew for another three). There are 31 8-packs on offer at BPL currently, and one can see which are available (or place a hold if you have an account) by searching for Book Club To Go in the library catalog. It's a pretty good variety of work: from Homer's Odyssey (the Robert Fagles edition); to Suite Française by Irène Némirovsky (which my book club read about four years back); to Richard Russo's Bridge of Sighs. Virginia Woolf, Kazuo Ishiguro, Kiran Desai, Dave Eggers, Edwidge Danticat, Marilynne Robinson ... these are thoughtful picks, just as you would hope and expect of librarians in a bookish city like Berkeley. 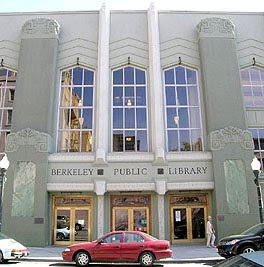 Did I mention that Flavorwire declared the main branch of the Berkeley Public Library the most beautiful in the U.S. in November of last year? It crosses my mind that publishers might get antsy about library-fueled book clubs. I mean, aren't those eight copies of a book that readers (probably) won't buy for themselves? I hope the industry doesn't take such a short-sighted view. First, I can say from experience in my own book club that some people check books out from the library while others buy. Folks tend to do what they tend to do. There's just no accounting for habit. My partner and I participate in the same book group, so we often buy one copy and check out another from the library, especially if we want to read in parallel. Second, book clubs are unlikely to live and die solely by the selections available at their local public library. Encourage a book club to establish itself and you're encouraging a community of consistent, engaged readers. This is a very good thing, I'd say, not only for publishers but for the world at large. Does your public library offer prêt-à-lire book club packages? Have you ever checked them out for your reading group? Ai Weiwei is a world-renowned artist who was detained early last month by the government of China. Evan Osnos, a staff writer with The New Yorker, wrote about the artist's arrest shortly afterward. Osnos wrote a Profile of Ai Weiwei in May of last year. The artist is recently well known in the west for his "Sunflower Seeds" installation at the Tate Modern (London): 1000,000,000 ceramic representations of sunflower seeds spread across the floor of the museum's Turbine Hall. Though he has long been outspoken in challenging authority, no one knows who in the Chinese government detained Ai Weiwei, or why, or where he is being held. This is illegal under China's own law. Renowned Chinese artist Ai Weiwei, was detained by a certain Chinese agency (which one is not clear, because not a single organization in China has claimed responsibility or notified his family of his whereabouts) more than a month ago on 3 April 2011. According to search results for Provisions of Criminal Detention Duration for Public Security Organizations yielded by the Baidu search engine, normal detention without formal charges may last from one to three days. For reasons such as preventing further crimes or escape, a special request granted by authorities of a township or above (such as municipality or province) will allow the detention without charge to be extended to 30 days. Article VI. When a public security authority at the level of a township or above makes a decision to approve a detention, the accompanying report should indicate the length of the detention time of one to three days. If there is a need to extend the detention to one to four days, or to thirty days, follow the request to prolonged detention procedures. Article IX. If it is not possible to ask the People's Procuratorate to examine and approve an arrest within three days after the suspects is detained, and if there is evidence that the criminal suspect may escape and repeatedly commit crimes, or commit gang crimes, the detention, after being reported to the public security authority at the level of a township or above, and if approved by the authorities, may be immediately extended to the thirty days. Where is Ai Weiwei? China: the world is watching. Kaiser Permanente is a non-profit health plan & medical group practice that gestated as a means to care for tens of thousands of workers streaming into Richmond, California shipyards as the U.S. geared up for World War II. The not-for-profit medical plan was formalized at the end of the war, as employment at the shipyards fell off. The organization is well-known for emphasis on preventative care and its public health orientation, and provides members with the convenience of making most services available at campuses that cluster medical clinics, labs, hospitals, and treatment centers in a single location. The numbers involved are large: over 8.5 million members in ten states; 35 hospitals; 15,000 doctors; $42 billion in operating revenue in 2009. Kaiser's mode of managing health care, a product of industrial need and medical efficiency, has been tarred with the "socialized medicine" brush from the start. According to Rickey Hendricks in an article titled Medical Practice Embattled... published in the Nov 1991 Pacific Historical Review, "local medical societies rejected applications for membership from Permanente doctors who they implied were champions of socialized medicine." 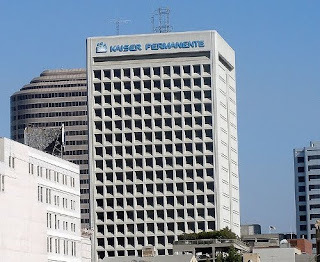 I've been a member of Kaiser Permanente in Oakland since shortly after I graduated from college. I've been pretty fortunate, as these things go, to have required care only occasionally and in moderation. Over the course of several decades I've known dozens of others who are also Kaiser members, with a variety of health profiles. For all the fearmongering about scarcity of access under managed care plans, never mind the Tea Party whack-jobs fantasizing about death panels, I haven't heard a lot of complaints. I have none. Well, okay, let's keep this fair and balanced. There was one opthomologist I saw quite a few years ago following an injury -- some idiot-drunk high school kid tried to brain me with a wine bottle then kick my head off when I dropped to the sidewalk, because he thought I had disrespected his girlfriend (he turned out to be looking for somebody else ... idiot-drunk, like I said). The doctor I saw roughed me up a bit as he examined my eye to see if any glass slivers had lodged where they weren't wanted (luckily not) ... his examination hurt and he sure didn't seem to give a toss that I was squirming, in obvious distress ... but even there, a brusque chair-side manner might have seemed less caring than it actually was, exacerbated by muscle trauma he couldn't see despite a pretty awful mass of bruising. Believe it or not the guy's name was Dr. Yacht -- I am not making that up. Can you imagine going through life as a physician wearing that name tag? I didn't bear a grudge ... in the end, I was glad to know that high school kid from Gehenna hadn't cost me my eyesight. I'd been feeling kind of crappy for a few days, but I really do try to avoid doctor visits unless I have an unavoidable need. My symptoms were getting worse, though, so I called in to what the folks at Kaiser call an "advice nurse." The advice nurse performs a sort of telephone triage. You tell what's going on, s/he asks questions, then s/he suggests that you take two aspirin and call if it doesn't get better; or gets your doc to write a prescription that you can pick up directly without an office visit; or instructs you to get to a doctor's office pronto. Depending. I called the advice nurse number a little after three. The usual automated greeter put me on hold for two or three minutes. When the nurse to whom my call was routed came on the line I explained what was going on. She asked me to take my own temperature while she waited on the phone (I hoped she had a good book to read, or recordkeeping to catch up on). She must have asked me twenty questions, and in the end she said, look, it's late in the day but I'm going to have your regular doctor give you a call within the hour. If he doesn't call within the hour, call back and ask for me by name. My regular doctor called in about thirty minutes. He said, why don't you just come in and we'll have a look. Not a long conversation. These doctors are scheduled by efficiency experts, I swear. Traffic was crappy, parking was scarce, it took me a half-hour to get to his waiting room. That said, my doctor saw me within 10 minutes of when I sat down. He looked, poked, probed, palpitated, all that intrusive stuff doctors have to do, and then he said I'd better see a surgeon for a simple outpatient procedure. He could schedule me for the next morning, or call down to see whether they could squeeze me in right then, while I was at the medical center. I voted for "let's get it over with" and the surgery clinic squeezed me in. I hustled over to the building next-door and found my way to surgery. A medical technician called me back into the procedure room within 10 minutes of when I sat down in their waiting room (are you seeing the pattern yet?). They looked, poked, prodded, palpitated, prepped, all that intrusive stuff surgeons and surgical nurses have to do. Then they had me lie down on a table, shot me up with a local anesthetic, did the deed, and dressed the wound where they'd cut me open. It was five o'clock. They shooed me off in the direction of the pharmacy -- the one just down the hall -- to pick up meds before it closed. When I got to the counter the prescription wasn't in the system yet. After about half a minute of poking around the clerk exclaimed, O, there it is! Hot off the press. I had my little bottle of pills -- wait for it -- within ten minutes of walking into the pharmacy. Did I feel processed? Molested? Crammed into a mold and shrink-wrapped? Heck no. I felt as if I had called my medical provider at 3 pm with a minor problem I didn't quite understand, and within 2.5 hours I'd consulted with a nurse, seen my regular physician, been referred to a surgeon, undergone an outpatient surgical procedure, and picked up the medication I was meant to take in order to clear up my problem once and for all. Why did I feel that way? Because that's exactly what had happened. Oh, and then there was the follow-up visit to the surgery clinic the next afternoon, for which an appointment slip had been scribbled out just before I left the procedure room. The ten minute rule? Still applied. Terrific nurse, funny, friendly, had a look at the scene of yesterday's scalpel-play and showed me how to change the dressing myself until the mess heals up. For good measure she gave me a fistful of gauze pads and a roll of surgical tape. They didn't even ask for a co-payment for that visit. This is what I think of when I think of "socialized medicine": a medical organization funded by a community of members, and tuned for efficiency to respond appropriately to patients' needs. And yes, I would be happy to pay more taxes to support provision of just this sort of socialized medicine for everybody who lives in my community. Indeed, in October 2004, Steve Lohr of the NY Times asked Is Kaiser the Future of American Health Care? That wouldn't be the worst outcome possible in this member's view. For a window into a much worse outcome, I refer you to Congressman Paul D. Ryan's plans for eviscerating Medicaid and Medicare (which I blogged about last month: G.O.P. proposes a death panel for health care ... the backlash has begun, says Associated Press -- let's hope it's got legs). My thanks to Kaiser Permanente, and the dozen or so medical and administrative staff that made it swift and painless to get the treatment I needed last week. 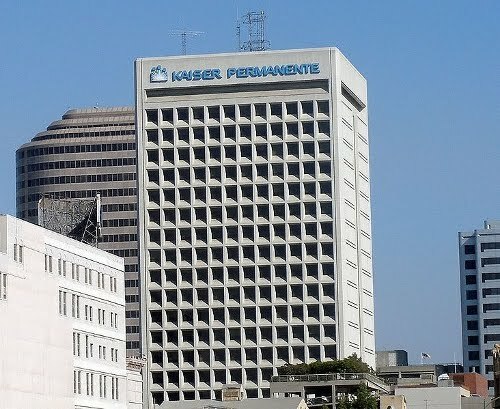 Thanks to Coolcaesar and Wikimedia Commons for the image of an office tower bearing the Kaiser Permanente logo in downtown Oakland.